This is not just another 'the modern learner is finicky and distracted’ compendium of statistics. (We admit we're already done of one of those). And it's not another ‘well, there are a gazillion solutions' listicle. Learning initiatives must be good for both the individual learner and the business in order to actually make a difference for the business. That's our POV, and the DNA of our platform. Over and over again we see in the corporate world lackluster results from tech-enabled learning programs that forget to trust the learner. So that's why this Declaration exists, to remind training program owners and designers of the mindset required to create truly great learning experiences. And see below for the full Declaration, complete with preamble and additional context for each Article. And we'd love to hear from you about this! How aligned are you with these Articles? 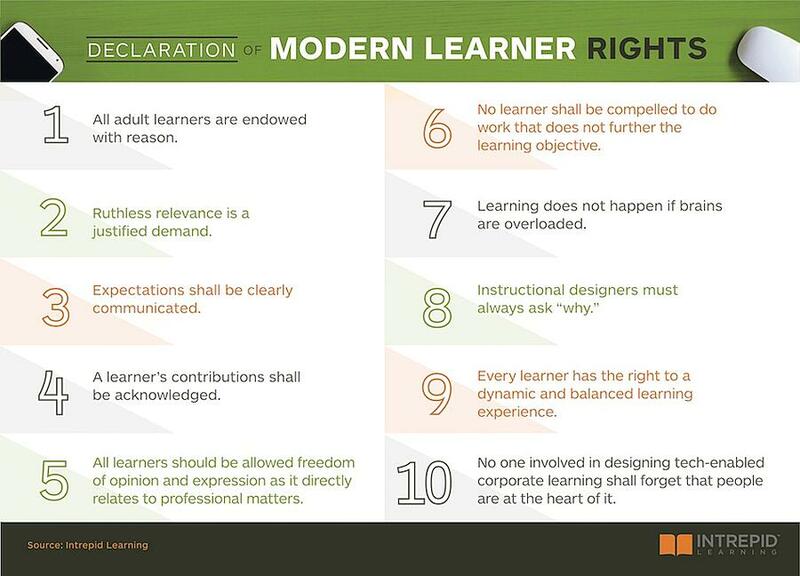 Do you agree that business leaders should care about individual learner rights? Please add your thoughts to the Comments below. p.s. There is also a pretty great origin story to this Declaration that Intrepid's Director of Learning Experience Design, Manjit Sekhon, has shared on LinkedIn that we think you'll enjoy.